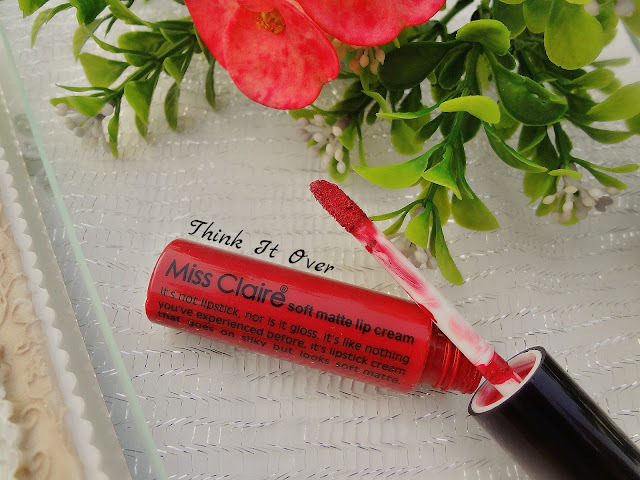 Miss Claire Soft Matte lip cream in shade no. 42: Price, Review, Swatches & Where to buy! I got up late this morning! There ain’t no possibility that I shall reach to the stop before my college bus comes and picks me up. So what do I do? Get ready in like 5-10 mins? Nah! I shall better utilize this time and upload this post online *wink*. So how is it going on with you guys? Few weeks back; maybe some months passed away I guess, I purchased few makeup products from Impressions Store (Karol Bagh, Delhi). Plus you know my love for affordable lip lacquers! This gives us ample reasons for a detailed review on Miss Claire Soft Matte Lip cream in the shade ‘42’. Let’s dive in! Description: It’s not lipstick, nor is it gloss. It’s like nothing you’ve experienced before. It’s lipstick cream that goes on silky but looks soft matte. Price: I bought mine at INR 190. Online prices fluctuate somewhere between INR 280- 325. Where to buy! If you wanna buy these at counters and you reside within the heart of India, that is Delhi, then drop down to Impressions Store in Karol Bagh! It’s a Beauty Heaven!! Believe me. Book lovers can associate it like a library wherein they desire to spend all their day, amid those racks of trillions of books that may transport you to a completely different world! Otherwise you can buy these online. Earlier online availability too was an issue, but not anymore! Buy yours from Amazon by clicking here. In case your loyalties are with Flipkart, click here! Another great website being Ohcutebox.com, for which you may click here. Packaging: If you have ever been glued to NYX store which only recently came to India, then you’d know how it looks an affordable dupe of their Soft Matte Lip cream. 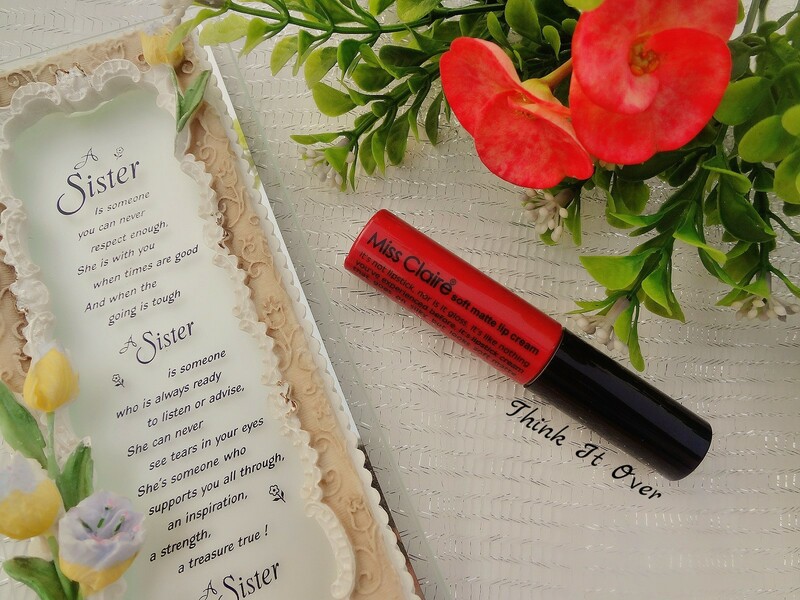 It seems the whole Miss Claire lip cream concept is inspired from NYX itself. The packaging is sleek, travel friendly and light weight. It does not leak and is made up of strong plastic; no where does it appear flimsy. Besides, it does not look cheap at all! Shade: The shade no. 42 is a soft maroon with very subtle hint of pink; like that pink appears only if it is applied light handedly. It would work so well as a fall lip color and the shade is gonna suit all skin tones alike, especially the Indian skin tone! 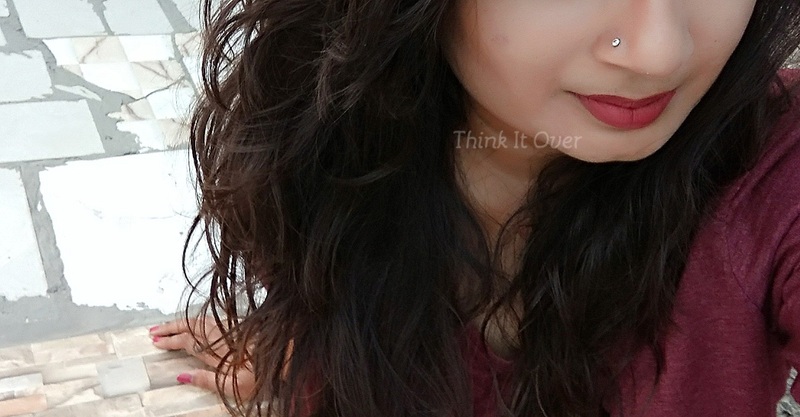 I am not really a bold lip color fan; I stay away from reds but this shade tempted me and I even ended up wearing this at a skincare brand’s small event. Formal wear or ethnic; it’s gonna go well with all! 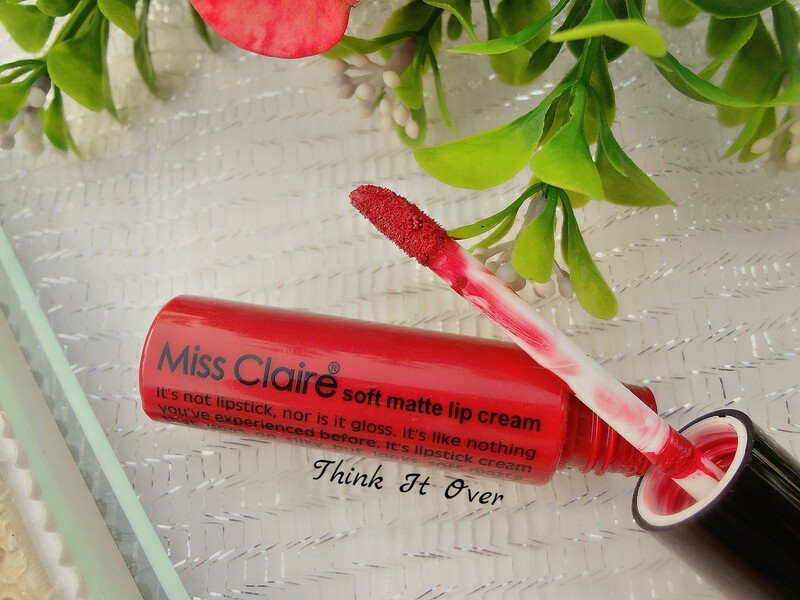 Texture: True to its name and description, it glides so smooth onto the lips like a gloss. So not hassle with you dragging the lip color. Within the duration of a minute, it sets into matte finish but the matte isn’t an extreme matte which feels uncomfortable and stretchy. It feels as if you’ve got your favourite lip balm smeared onto the lips thoroughly and the top most finish is kinda matte. In short, it does not have an uncomfortable matte texture. It’s not been the first time that I used these! 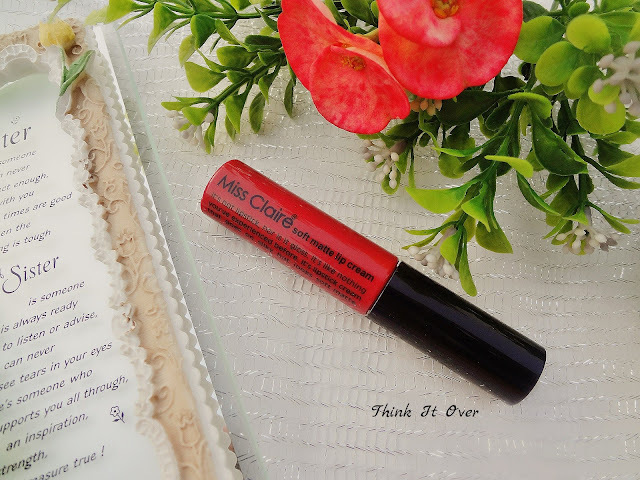 I mean my first year into the blogging-sphere revolved within my quest in finding these Miss Claire Soft Matte Lip Creams. This one I think is my third shade and I still won’t mind buying more because to be honest, I intend to look out for budget friendly options. And if you are getting nice products at such a price range, then why not? So, these lip creams are definitely long staying due to its matte texture. They have the potential to resist water but are not completely water proof. Drink something, eat a snack, it won’t budge! But in case post drinking it gets wiped by any reasons, it’s gonna come off. Snacking does make the intensity of the lipcolor go low but it leaves off a faint tint. Though, my other shades do not transfer to cups or glasses, somehow, this shade does transfer. Plus, this shade on settling is creamier too. After a proper meal, you would wanna run to a mirror and re-apply. Also, the wand is dissected at an inclined manner, making it easy for defining the lips. You would not need to use separately a lip liner. It perfectly fits into the cupid bows and corners of the mouth. Earlier, I was hardly away how to work with liquid lipsticks. But applicator like these are so amazing that you don’t really need to start a war while applying a lipstick. Rating: 4 out of 5. Diwali Makeup Tips & Tricks! People at Diwali: Usual v/s Makeup Lovers!